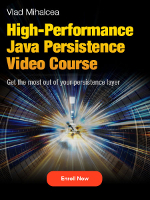 In this article, we are going to see how to use a UUID entity identifier that is auto-generated by Hibernate either in the JVM or using database-specific UUID functions. The Post entity has a UUID identifier and a title. Now, let’s see how we can map the Post entity so that the UUID identifier be auto-generated for us. When using JPA, we can use the GenerationType.AUTO strategy of the @GeneratedValue annotation to assign numerical identifier automatically, based on an IDENTITY column, a SEQUENCE or the infamous TABLE generator. "insert into post (title, id) values (?, ?)" The getGeneratedVersion method defines what type of UUID we are generating, according to the IETF RFC 4122 standard. In our case, 4 stands for variant 4 (random) generator strategy. Now, we can call the uuid_generate_v4 function to get a variant 4 UUID based on IETF RFC 4122 specification. The uuid2 strategy stands for org.hibernate.id.UUIDGenerator which we want to use instead of the legacy org.hibernate.id.UUIDHexGenerator that’s registered under the uuid name in Hibernate. The @Parameter attribute is used to customize the UUID generation strategy via the uuid_gen_strategy_class parameter value which takes the fully-qualified class name of the org.hibernate.id.UUIDGenerationStrategy interface implementation. Notice the calls to the uuid_generate_v4 PostgreSQL function which is used to assign the UUID identifier values. 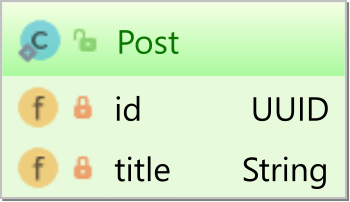 Therefore, auto-generating a UUID identifier when using Hibernate is fairly easy. 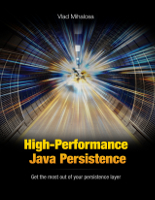 You can either allow Hibernate to use the Java-based UUID generation strategy or you can delegate this task to the database. The latter option requires providing an implementation of the org.hibernate.id.UUIDGenerationStrategy which is rather straightforward. Do you know a way to store in MySQL as a string instead binary? Check out this article for an example. What do you do if you want to use something like @GeneratedValue and @GenericGenerator on non-primary key properties? You can use the @Generated annotation. Now, how can we select by Id? We are passing variables from a client side as and comes to the server site as JSON. What to do in that case? What is the best practice? If the id is a UUID, then you just use that and declare the Repository as <MyEntity, UUID>. It’s the same with any other id type.